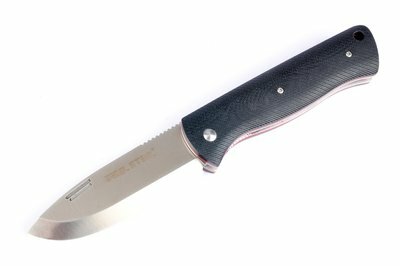 Robust folder specially designed for bushcraft purposes. The well designed shape ensures perfect control over your work and the nicely rounded scales prevent hot spots. This model features the for bushcrafters typical "Scandi" grind and satin finish. It comes with a pouch with belt loop. This the special "Free" version because it does not have thumb studs to open the blade but it has a "nail nick" which makes this knife a "two-hand opener". In some countries (i.e. Germany) it is not allowed to carry a folding knife that can be opened with one hand and locks the blade automaticaly. This "Free" version was specificaly made with those countries in mind.